Over 1,000 children have benefited greatly from the bikes they have received via the Great Bike Giveaway. Many of these families have shared their experience with us. Thank you! Thank you! Thank you! I cannot thank you guys enough. Kenneth loves his bike. He laughs almost the entire time his on it; and his brothers are happy that he can finally ride with them. Kenneth actually holds the handle bars and tries to paddle on his on already. This will be a great tool for him to use while having a ball. Again, thank you. We would have never been able to afford this on our own. You have changed his world . I am Tycen’s mom and I am in tears today. Tycen has not had a bike he can ride in years. He has poor core strength and leg issues due to neurofibromatosis type 1 and just had another leg surgery two months ago. He currently walks with a walker, but loved the freedom of his bike for the first time today. With the exercise the bike offers, he’ll be walking unassisted in no time! Thank you Great Bike Giveaway! Thank you to the Friendship Circle for sponsoring their annual Great Bike Giveaway. Because of your organization’s vision and generosity, my daughter now has an opportunity to experience a simple joy of childhood- riding a bike. Lucy has Angelman Syndrome which makes it almost physically impossible for her to ride a bicycle. As a mother, I felt such a sense of despair as I noticed Lucy watching her older sister and younger brother ride their bikes with such longing. Now, Lucy has received her bright blue Rifton adaptive bicycle and her smile says it all. We are eager for the weather to cooperate so we can begin our biking adventures! Olivia is over joyed in receiving her new bike!!! We as a family will be able to enjoy the summer riding bikes all together! Thank you so much for this contest and a special thank you to Olivia’s teacher and team for providing us with the information regarding this contest! We are beyond thrilled and Olivia will enjoy the bike for years to come! When we first started to participate in this contest, my husband and I became very excited for our daughter to be a part of such a great event! We started telling all of our friends and family and everyone began spreading the word and helping raise awareness for the great bike giveaway and before we knew it, all of our friends were supporting the event and even donating to the cause. When we found out Ava won we were so ecstatic! We couldn’t wait to tell Ava. When Ava found out she had won a bike she just couldn’t wait to tell all of her friends and family about being able to ride her new bike this spring. When we gave Ave her bike she was both nervous and excited. We have had perfect weather for Ava to ride her bike and she cant wait to get home from school so she can ride it around outside. We are so thankful that we were part of a such a great fundraiser! Our daughter can now ride her new bike around with her friends and family and is able to experience this memorable part of her childhood. Where do I even begin?! We are so incredibly amazed and grateful that Gwen won a bike! She loves bein outdoors and playing with her little brother, her friends and her cousins. She always gets upset when watching her brother and others ride their bikes and she has to ride in a wagon that she’s too big for but not anymore! The happiness and joy that she displays while ridin her bike is a dream come true! It makes us so happy but more importantly it makes Gwen so happy! We look forward to all of the memories she is going to make with this bike and one day we will pay it forward! Thank you so much for this incredible gift and giving our girl freedom! We feel so lucky, and loved! We are going to have so much fun on this bike. Thank you to all who voted and donated to the Great Bike Giveaway. Thank you to Friendship Circle of Michigan for the mission to raise awareness for the need of adaptive bikes and provide as many of them as possible. Only a few people will know the you in my heart I felt seeing my daughter get her bike n ride her bike. She has wanted her very own bike for so long that I had almost given up thank you all who participated in this you n fulfilment that you have given my daughter. And now she feels she can do anything thank you for restoring her motivation n happiness. I can’t say thank you enough n tell u how much you all are appreciated. How can one put into words the excitement and gratitude that they feel when their child receives such a generous and precious gift. We are so thankful to be able to help Maikaila ride a bike that is safe for her. I am beyond excited every time she gets on the bike and starts pedaling her little heart out. She of course loves going backwards especially when we want her to go forward. I had entered the giveaway before and we did not receive a bike but I waited a few years and tried again. I am so happy that I didn’t give up hope. Thank you for this amazing gift and for the happiness we will have for years to come. We are so thankful and blessed to have received this bike. We’ve gone on a couple 20 minute bike rides in the two days we’ve had it. Kaylie loves it! The smiles and laughter are so thrilling! It’s the perfect bike for us, i feel like we are part of the rest of the riding world now. Lots of thumbs up and compliments from our neighbors, friends, and the people we ride past, thank you for a dream come true! WOW !!!!!! is all I have to say. I didn’t believe it was real until I saw the truck in front of my house and the driver took the pallet off and we took the bike out. I brought the bike into the house and parked it in the kitchen. Hannah saw it and crawled over to it and just looked at on her knees. She knew it was for her. Even know she doesn’t speak I could tell she knew. We cruised around for a while in the house then went outside put some music on for her and off she goes. My Wife and I just want to thank everyone involved in the Great Bike Giveaway especially Friendship Circle from the bottom of our hearts. I am still in shock that Hannah won this but man did you make my Little Girl happy. This is the coolest thing ever. Ysa L O V E S her Buddy Bike!! When she first rode the Buddy Bike she said “I am good at this Buddy Bike!” We have been able to ride our bikes to the park, birthday parties, family bike rides and today will be our first day riding home from school!!!! So grateful for the confidence, joy and freedom Ysa is gaining in the few short weeks of having her Buddy Bike. Thank you Friendship Circle for the Great Bike Giveaway, and thank you Buddy Bikes!! Owen loves his shiny, new Rifton trike! His smile says it all. This contest process has been a phenomenal experience for our family. Not only did we win a fun, outdoor tool for Owen’s therapy, but we also were lucky enough to experience how many people love our sweet little boy and will do anything to put a smile on his face! Our hearts are full. :) Last but not least, thank you to everyone involved in The Great Bike Giveaway; this is a truly awesome gift you have given our son. When Briana learned that she had won a bike….a huge smile instantly lit her face up. Even though she is mostly nonverbal…..she could not stop talking about it! The day that the bike arrived and Briana caught her first glimpse of it, that huge smile of hers got even bigger. The first “test drive” was awesome. The neighbors came out to congratulate her and check out her new ride and the look on Briana’s face was priceless. The rides after her first also attract the neighbors and every child that passes will stop and comment on what a cool bike Briana has. I can tell she is proud of finally being able to do what the other children in the neighborhood are doing. Thank You to all the supporters of this wonderful contest. You have given my daughter a sense of belonging and a new found confidence. We are so very thankful for Paul’s new bike! The joy on his face is priceless. When Paul was younger he rode a 12″ bicycle with training wheels. As he got bigger we got him a bigger bike. The bigger bike scared Paul. Due to his lack of balance and coordination he had many falls, increasing his fear of traditional bikes. Now that Paul has received his Mobi Cruiser bike, he begs to ride it everyday. This bike enables Paul to stay active and ride bikes with his brothers. The look on my daughter’s face says it all. She is so excited to have a bike she can ride. She asks to ride it outside everyday! I didn’t tell her I’d entered her into the contest this year so she was even more surprised to win. Without this contest, she wouldn’t have this wonderful bike, and I would have missed her wonderful smile. Thank you for this bit of independence! Thank you so much Friendship Circle and Rifton. My Kelly was so happy when she received her tricycle. The smiles did not stop from the moment she got on the tricycle. She was even able to ride together with her twin sister! There is not much that they can do together but riding bicycles has definitely been one thing they have wanted to do and thanks to your contest, now they can. We are looking forward to the spring and summer to get out and ride all over the neighborhood together! We are all so grateful. Thank you! Our family is extremely thankful for Tabytha’s new Strider bike! Within two weeks she went from falling over even when assisted to now being able to walk with her bike! We leave her bike in the house and she is eager to show of her new skills daily! Her physical therapist has even seen improvements with her balance. This is such an exciting time for our family and we look forward to Tabytha overcoming many obstacles with her bike. Thank you friendship circle, you made Abby really happy with her new bike! Abigail has Cerebral Palsy due a lack of oxygen at birth caused by neglect of her doctors. Her CP affects her balance and muscle tone. Everything she does requires extra effort. She’s been a fighter since the day she was born and she held onto life and lives life to her maximum potential. This bike, as you can see, gives her the independence and freedom of being able to ride it by herself! That is priceless! We were very touched by all the support we received from family, friends and our school community, and for that we will ever be grateful. Thank you to all the sponsors and companies for donating the bikes and to the Great Bike Giveaway, thou guys are awesome! And last but not least, thanks to the special needs community for being an inspiration of courage, strength and resilience. This bike has been such a huge blessing! All Robert wants to do is ride his bike all day long! It allows him to be like other kids. He is able to play with kids in the neighborhood now! On a positive side this bike gives him therapy that is fun! It will keep his legs strong. I can’t express in words how this bike has improved his quality of life…it just has and it’s amazing! Thanks for making this happen! We are so thankful for the outpouring of love and support we received from family, friends and strangers. This contest has not only allowed us the opportunity for our son to win his own bike, but also meet some incredible people along this journey. Thank you Friendship Circle for changing our lives! Hailey had big smiles when she saw her new bike. It took several months for the weather to warm up for her to be able to ride it for the first time. Hailey Loved her first bike ride. She was giggling so hard especially when we would go over bumps. She laughed when we had to go up a small hill because we would giggle her back and forth. I know if Hailey could talk she would thank Friendship Circle so very much for doing something so special for all the children with special needs. We didn’t tell Wade about the bike, we wanted it to be a huge surprise and boy was it!! He loved it!! He is a daredevil and has already tipped it lol he is fine, just likes to turn those corners too fast and too tight. He loved being able to race his big brother too. Thank you so much for the beautiful bike that you have blessed Janelle with. She really enjoys riding it and it has given her a lot of freedom! She feels like a big kid now. She loves to ride her bike around the neighborhood and to the park. Sometimes too much son….and without asking. Fortunately, we live right around the corner from the park. Your generosity has changed a life for the better! May you continue to be blessed and bless others through this program! Her video is on YouTube at this link. It is too big to upload. https://www.youtube.com/watch?v=bUGBC35X2NE I hope this helps. If not, let me know. The smile on Kayleigh’s face as she is riding this is wonderful. She has had a hard time with the steering and pedaling, so we got her the rear steering bar until she gets the hang of steering and the stationary stand to learn and practice pedaling. We got those last week when we had a lot of rain, so we are hoping to get out this week and see how things go. Thank you so much for everything! Friendship Circle and Rifton have both been wonderful to deal with, and very generous. Annaliese (Dannie) won a bike through the Great Bike Giveaway. She loves to ride but when she finally had a bike of her own at home, she was very uncertain of it. She was determined NOT to get near it. So we spoke with her Teacher and PT and they said we could bring her new bike to school and let it be in her familiar riding environment to try out her bike. She now LOVES her new bike and flies like the wind!! Thank you so much for this program… this is a gift we could have never given her on our own. Alex was so excited to receive his Mobo trike from Great Bike Giveaway! Alex is a very adventurous little boy who loves exploring and the outdoors. Diagnosed with autism at age 4, he has had a lot of difficulty with the balance and coordination he needs to ride a bike. We have always been a bike-mobile family, and it has been harder to include Alex after he outgrew the bike trailer, and his pedal car is heavy and slow, which makes it hard for him ride far or keep up with anyone who’s not on foot. His new Mobo is much lighter and quicker, he had it mastered before he got to the end of the driveway, and he has been darting all over the neighborhood. I have to wear my running shoes to keep up with him! He was so excited to hear that he had won one of the bikes in this year’s Giveaway. The staff at Mobo was excited to hear from him, and even let him pick out his favorite color, blue! Alex read all the instructions himself, and even helped assemble it when it arrived. He loves his new bike, and wants to ride it all the time. Thank you all for bringing so much enjoyment to this little boy! We have previously used a Rifton trike for therapy with Ashur. He loved being on the trike and begged for one. Unfortunately the cost was too high for our family to afford. We tried to raise funds our self via go fund me and while we received a ton of well wishes, well wishes was all we got We were shocked beyond belief when my son won his Lime Green (his favorite color) Rifton Tricycle. Ashur has several diagnosis including cerebral palsy, epilepsy, and autism. We have tried in the past to use a typical tricycle but all attempts were failures. The first time our wonderful PT put his on a Rifton Tricycle his face lit up and he was ear to ear smiles. For our family an adaptive bike allows Ashur to have a new level of mobility and the ability to play with his sister and friends who love to ride bikes. This tricycle will allow Ashur to gain much needed muscle strength in his trunk, and legs so that he can continue to increase his ability to walk steadier and farther. For our family this tricycle is a blessing beyond words and allows my son to be just a normal 6 year old with his friends instead of sitting on the side while they all play. Thank you again for this wonderful gift. The look on my sons face when he got his bike was worth more than anything in this world! Thank you so much!!! Meagan loves her new bike. She just giggles the whole time she’s riding! She loves the wind in her hair. Thank you for giving her this experience and joy! Thank you so much for allowing Zack to receive a bike. He has been wanting to ride a bike like his little brother so bad. Today was the first nice day that we were able to have Zack try it for the first time. You can see how his brother is helping Zack to learn how to ride it. I will try to upload more video once he gets a better grasp of his new bike. Thank you again so much! 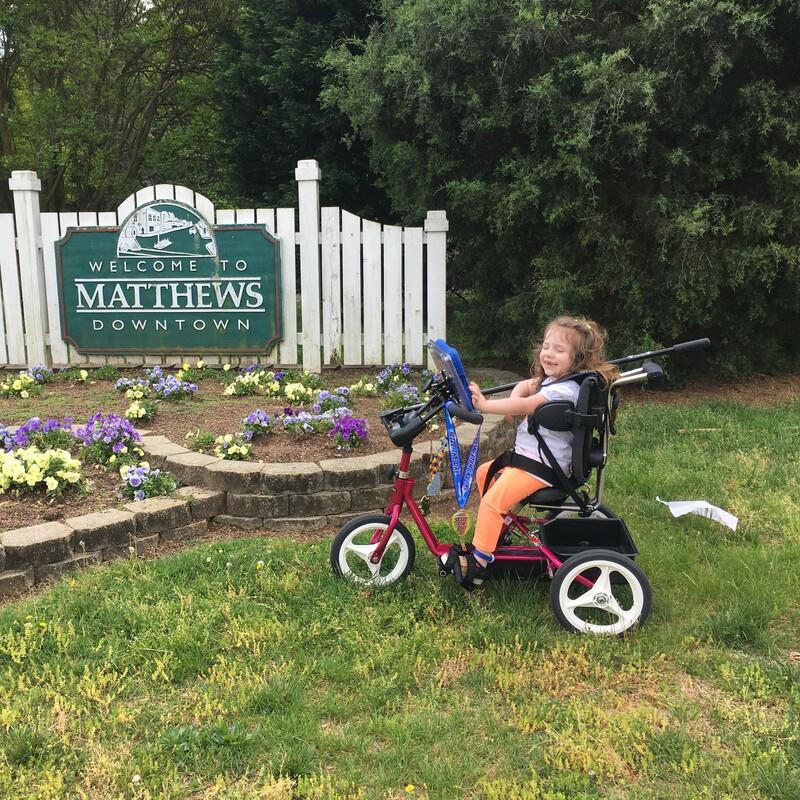 Due to her special needs and physical limitations, Megan has been unable to really get out into the community and nature since she outgrew the bike trailer several years ago. By winning this bike, several opportunities have opened themselves up to her! She can get out into nature again, without being confined to the yard, something she has always enjoyed. We received the bike yesterday, and already she is working the pedals, following instructions to turn the handlebars, and ringing the bell to let people know she is coming! We are so excited for her, and appreciative of the Great Bike Giveaway, for giving us an opportunity we never would have had otherwise. Sophia was so excited to be a winner in the great bike giveaway!! We received her bike a few weeks ago but she was having some issues with her left leg at the time. (She has OI, brittle bone disease, and breaks her femurs often). Her leg has been feeling much better and she took off in her new Triaid Tracer Junior. I can now watch her go down the hill on our block without nearly having a heart attack. This bike is so safe for her. It is just a little big for her which is why we put the pillow behind her, but this bike will last her a very long time and she loves it! Thank you Great Bike Giveaway for making her so happy! Words cannot express how grateful we are that Gilly won a tryke. He is a very happy boy and is even happier now that he can participate in bike rides with his friends. Seeing him on the tryke for the first time and him starting to pedal on his own after only a couple laps broug tears of joy to my eyes. This has given him so much independence and freedom. We are blessed for the opportunity and excited for our future park trips! Can’t wait to participate in next year’s giveaway to help other kiddos like Gilly win trykes. thank you so very much! We’re so thankful for Nevaeh’s new Trike. She loves being outside. Without the Great bike Giveaway we wouldn’t have been able to get her a bike. It came just in time for her 10th Birthday!!! Dakota was so thrilled when he received his bike. Since riding it the first time he tells everyone about it including school staff, family and strangers he meets in the community. He has been riding everyday at school and the first time he rode it outside at home, he said “Cody’s a big boy now”. He has discovered how fast he can go and loves the freedom this bike has given him. We never thought owing an adaptive bike would ever be possible. But thanks to Friendship Circle and all the generous donors, it’s finally a reality. It was amazing to see Norah’s face light up the first time she saw her new Strider Balance bike. She instantly got on like she knew what to do! Now she is so happy to be able ride bikes with all the kids in our neighborhood when she would just stand and watch before. Winning this contest and this bike has given my little girl a chance to be a kid. Thank you so much. Jeff is riding a bike!!! He and his dad had fun assembling it together and he was ready to ride. He was very excited about the flag on it. As soon as he was on it he was ready to ride around the block. I can’t express how happy I am to see him enjoy the freedom of a bike ride. I cannot thank you enough. Words cannot express the sheer joy that this new bike has given both Katie and her family. Katie is a happy, high spirited 13 year old girl with mild cerebral palsy. She’s been through much in her short life, Botox, surgeries and many hours of therapies. The therapy bike was used as a reward for her after enduring the exercises and stretches. She had such freedom and mobility with the bike, it was a joy to behold! Winning this bike has given her such renewed energy and freedom. Sending a huge hug and thank you for giving us the opportunity to ride as a family. We weren’t sure how Bethany would react to trying a “big” bike and how much coaxing we would actually have to do to get her on the Buddy Bike. Boy did Bethany surprise us!!! Dad hopped on the Buddy Bike then Bethany wanted on and off they went. We also are amazed how light the Buddy Bike is. Looking at her face you can tell Bethany loves her Buddy Bike!!! Omg! Hunter loves it, jumped on right away. This was the first time he got on it. Rode it like a champ. He does have shoes and a helmet and we were close by. He had so much fun! Tomorrow we are all going for a ride with helmets and shoes! Thank you so much we are truly blessed! Emmalyn was so excited when she found out she had won a Strider Balance Bike. She asked everyday when her new bike was arriving. It came when she was at school, and we put it together for her to ride that evening. She couldn’t wait to try it out. She was a bit hesitant at first, but then got the hang of it. By the second day on the bike, she was already lifting her feet off the ground for a few seconds. This was so awsome to see! She had a bike with training wheels the last several years which she outgrew, but she never wanted to ride it, because she didn’t like the tippy feeling and couldn’t keep her balance if it started to tip. I am looking forward to a great summer with her on Strider Balance bike! This bike is going to help her with balance and coordination, but most of all confidence in herself! Thank you so much Friendship Circle and Strider Bikes! I can’t wait to see what she does on this bike by the end of summer! You know, I’m a kid, just like any other kid. I like to do kid things, like play with legos, color, and shove oatmeal up my nose. But because my legs don’t always work, I can’t always do the fun kid things that other kids do. But thanks to this great trike, I can ride around outside with my sister. Thank you so much! We are so happy for our son to win this bike. This bike is really nice. Its very safe for him and i am very very happy to share this is he started paddling in first time when he started riding this bike. I am sharing a small video of him paddling first time with his new bike. It was best smile we got from him in a long time when he was riding his new bike. Thank you friendship circle for this great bike giveaway and making my son’s life more joy able. Also, thank you rifton for making such a great bike and their support. Oh my gosh!!!! First day on his bike and he is in HEAVEN!! What a blessing! Now he can keep up with his little brother and feel a sense of independence!! THANK YOU THANK YOU THANK YOU!!!!!! My daughter loves her new bike! She can go with her brother and sister now, and let her feel more independent. This has giving her more opportunities than I could of ever financially do. She loves it! The smiles and laughter while riding it is proof enough for me! It is so easy to use, it is truly amazing! Thank you The Great Bike Giveaway!! you have made one little girl truly happy, now she can ride with grampa and other adults! Logan absolutely loves his new bike. He is learning to pedal it with minimal assistance and it has been a great form of excercise and also provides a new position to help with his back problems. Logan has been able to become more active and do something that all kids no matter what their ability should be able to do. The bike has been a blessing and we are very thankful for it. It has made Logan a very happy little boy. Thank You!!! Hannah was so excited that she won. We kept it a secret from her of what color the bike was going to be. When the box came she hugged it. When she opened the box her mouth dropped when she saw that it was her favorite color pink. She could not wait to put it together, so she helped her dad. She rode it in the house after it was put together because it was dark and rainy. Because Hannah has had vision and balance problems she has not rode a bike in about 10 years. She got on the bike and rode it down our lane like a pro. Thank you so much for putting a Smile on Hannah’s face and ours. Sam loves to ride his bike in our neighborhood. Now that he is bigger and needs a full size bike, it is very difficult to find adaptations to regular bicycles. When we found out that Sam could be eligible for a bike that fit his needs, we were so excited! Abram absolutely loves his new bike. It’s the first thing he goes to every time we go outside. He can’t pedal on his own yet but he loves being pushed around and clapping and laughing as we go around. We couldn’t be more thankful for this bike and all of the new experiences it has brought for him. Thank you Great Bike Giveaway for giving the gift of freedom and feeling like he can too be a part of riding bikes with his sister and myself. He was so happy to see the bike assembled in the garage. He actually busted me putting it together and the smile on his face was priceless. You have made him so happy! Thank you from the bottom of our hearts!! Getting the bike was a dream come true for our family. Bike was easy to assemble and adjust. Cameron enjoyed his first ride and suspect this will become part of our daily activity. Thank you for the opportunity to win. Kyle loves riding his bike. Here he is with his Aunt Teresa at Swan Creek Metropark. He also lead a few biker friends with his dad . Dontavis loves his new bike! He is enjoying riding it around the neighborhood and visiting neighbors. This bike is going to help to strengthen his body, his social skills and his self esteem! Thank you so much for this wonderful gift! Sadee rode her adapted Rifton tricycle for 2 hours straight today!!!! BEST.GIFT.EVER!!!!!! THANK YOU, THANK YOU, THANK YOU!!!! Hailee is 10 and she has Spina Bifida, She loves the Crusier and took to it right away although I did have to take the pedal adapters off of the Triton bike she has in order for her to keep her feet on the pedals. I ordered the pedals for the crusier with the velcro (very expensive and I feel like they should have been included since these bikes are for handicapped children). You can see from this video she is loving it. Thank you so much! This was our second year trying to get her a bike. We are so thankful to have been able to do it this year, thanks to this amazing group and all of the wonderful individuals that donated. She loves the freedom and independence her new bine gives her. Thank you so much! Kaitlyn received her bike today and she was so surprised! She wanted to take it out for a spin immediately! She loves it and the smile on her face says it all! Thank you! Alexis was very happy when she receive the bike she won. She has been smiling ear to ear since she has received it. She love riding it. Thank you so much for drawing her name and purchasing this bike for her. She truly love it. You made her dreams come true of riding a bike .thank you so much. Leland loves his new bike!! Words can’t even describe what it means to be able to watch him ride around with his brother!!! It’s the little things in life that really do mean the most! Thank so much!!! I am so grateful, ,, my son Joshua loves his new bike,thanks to Friendship Circle, The Great Bike Giveaway, and Flaghouse bikes……Joshua loves being able to ride bikes with his sister, and neighbors .. He will be able to enjoy his bike for many years…..
My son and I both love his bike. He picked up on pedaling so quick. I’m one proud momma! I’m beyond grateful and thankful that he won the bike. And I can’t wait to see how much it will help in his progress. Kennedy was over the moon when her bike arrived. She immediately made plans to go riding this weekend and loves the fact she can power her bike on her own! This is a very special gift you have given to our very special daughter! THANKS! This bike has been an incredible blessing to Oleg. The first day he road it he exclaimed “I never thought I would do this!” This has given his the opportunity to ride a two wheeled bike, something he thought was impossible. It is also a reminder to us that nothing is impossible. We are so thankful that Jenna won the Flaghouse bikes! She was so excited to get her new bike and to ride it with her family. . .she’s 11 and she was never able to ride bikes before. . .now, she is set! And to have a basket will be so fun for her too 🙂 Thank you so much to all those who contributed to this great giveaway allowing Jenna to have a bike of her own. We are so thrilled for Cameron. He received his bike last week and was able to ride it for the first time this past weekend. Thank you so much for this amazing tricycle. We are so grateful that at ten years old, he is finally able to ride a real bicycle. We are so excited that Cayenne won her very own Tryke. She has had it a week and we can’t stop her. She can now keep up with her brother and friends. Thank you so much for all you do and giving her the opportunity to be a kid. Scott laughed and laughed when we got him on the bike. He started trying to pedal before we were even finished getting him set up. He absolutely loves his new bike, and he is fast! Scott’s grandma said never In Her wildest dreams did she never thought she would see Scott ride a bike. Thank you! Jia Min John received the bike a few weeks ago and was unsure how to use. A balance bike was very new to him. After much trial and error – he is now able to navigate our driveway and is beginning to balance and coast with the bike. He enjoys riding and as he has told us – “…always wear your helmet.” Thanks for giving our child a bike that allows for freedom and exploration. His blindness is not a limiting factor to having fun. Kalob is so excited to get out on his new Rifton bike! He had to wait several days after it’s arrival because of bad weather but he is all smiles now! He was just barely big enough for the large model so this bike has lots of room to grow with him over the upcoming years!!! Raymond was so excited to pull all of the parts of the bike out of the box. He loved helping me put the bike together and was thrilled about the Strider Jersey that was included. Kentley is So happy, and excited to be able to ride her bike to the park, just like her brother and sister! The very first thing she did was hop on her new bike, and ride it uphill to the park! Thank you so mix for the bike! The timing is perfect too, because her 5th birthday is this week! We received the buddy bike that Finley won in the giveaway. We have entered every year and are so happy we finally won. We actually have two sons with special needs so this bike benefits them both. We tried it out for the first time yesterday and the boys loved riding with dad! Dad loved chatting about their day while enjoying the cool evening ride. Finley is learning to pedal and may need toe clips, but I was so happy to watch the boys enjoy a bike ride. The family will be enjoying the trails in our neighborhood soon thanks to Buddy Bike, the donors, Friendship Circle and everyone involved. Bless you all! We are beyond blessed by all of the donors contributing to THIS smile! THANK YOU! Her squeal of excitement was priceless and she has been on her bike everyday since it arrived. Thank you for this gift that will grow with her for many years to come! Pablo is 12 years old, he was diagnosed with cerebral palsy are so many limitations to play with siblings and neighbors. now that he has the tricycle he could spend some beautiful moments outside, active life again. he is happy, and enjoyed his tricycle. thanks for the opportunity to participate and to acquire this tricycle. Annabelle got her bike yesterday and loved it! She rode it all around the neighborhood and showed all her friends. They all thought it was pretty cool. You could see the happiness, freedom and excitement on her face. Thank you for this amazing gift, we will forever be grateful. We are so grateful to the Great Bike Giveaway! Madison was reluctant to get on the bike at first but she has learned to trust her partner and is loving the fact that she can ride along side her friends and family. Aiden loves his new bike. He has never got to ride before. It’s 100 degrees outside, so after an hour I had to convince him we have to take a break. I just want to thank the Friendship Circle who had this great contest. My daughter is slowly learning to balance on her bike which is so important to her daily living skills!! Brandi was so excited when she got home. And saw her new bike. She hasn’t stopped riding it since we got it. She also loves riding her new bike with her sisters. She loves her new bike. Bolo loved riding his new bike while jamming out to Bruno Mars today! Thank you! Jeremiah loves his new bike. We can’t thank you and all of the donars enough. This bike will be such a helpful tool in Jeremiah’s therapy. We are so excited that Caleb has won the Duet bike. He has always wanted a bike and was never able to get one due to his Cerebral Palsy. He is now able to ride and do one more thing another kid is able to. Thanks so much for the contest and making Calebs dreams come true.